Now that ’60 Seconds to Change Your Life’ Competition 2018 is live we thought it would be brilliant for you to hear why you should be brave and enter. 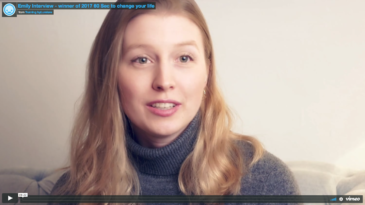 But don’t take it from us – instead here is last year’s winner Emily on why she thinks you should “step outside your comfort zone and go for it“. The prize pot this year includes a place on our Foundation Programme as well as some amazing prizes worth over £15,000 including full brand and website design and a Nikon D750. For full details on the competition and the amazing prizes visit The Photography Show 2018 website. We can’t wait to see YOUR entry… Good luck!